Growing evidence shows that the neurotransmitter serotonin (5-HT) modulates the fine-tuning of neuron development and the establishment of wiring patterns in the brain. However, whether serotonin is involved in the maintenance of neuronal circuitry in the adult brain remains elusive. 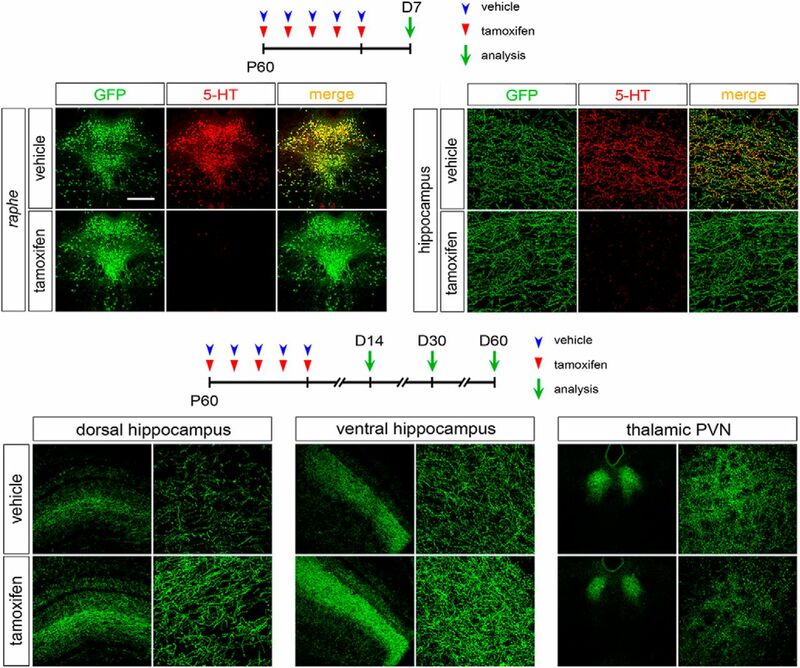 Here, we use a Tph2fl°x conditional knockout (cKO) mouse line to assess the impact of serotonin depletion during adulthood on serotonergic system organization. Data show that the density of serotonergic fibers is increased in the hippocampus and decreased in the thalamic paraventricular nucleus (PVN) as a consequence of brain serotonin depletion. Strikingly, these defects are rescued following reestablishment of brain 5-HT signaling via administration of the serotonin precursor 5-hydroxytryptophan (5-HTP). Finally, 3D reconstruction of serotonergic fibers reveals that changes in serotonin homeostasis affect axonal branching complexity. These data demonstrate that maintaining proper serotonin homeostasis in the adult brain is crucial to preserve the correct serotonergic axonal wiring. This work was supported by Italian Ministry of Education, University and Research (MIUR) (Prin 2008, 200894SYW2), Toscana Life Sciences Foundation (Orphan_0108 program), and Norwegian Research Council (to M.Pa.). B.P. and M.Pr. were supported by the PhD Program from University of Pisa. S.M. was supported by the Regional Program and European Social Fund.